He stays ahead by being two weeks behind. That's how Merrit motivates himself to push forward through good days or bad. In his mind, nothing is done and everything is to come! When I was 13 I crashed through my parent's front door while playing tag at my birthday party. I had deep lacerations up my left arm and elbow. Doctors told my parents that it would be an uphill climb to get that arm to the same strength as my right arm. This motivated me beyond belief. It was also my first exposure to weight training. I had very limited (5 percent) strength early on and only worked out in water. Over time, I focused on building my arms symmetrically. No way was I going to let my right arm show off to my injured left. They were in this together, and they would not push what my heart told me they could do, until they could do it together. It took me five years and many setbacks to fully recover and get to 100 percent. This gave me an appreciation for weight training and an understanding for what it took to build our most important instrument: the body. I realized it might be a good idea to start training legs hard in my 20s. 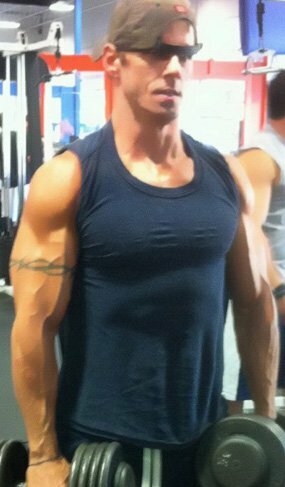 It's so easy to go to the gym, pump some iron, throw on a t-shirt with jeans, and say, "All good!" Legs get neglected. I had to play the catch up with my legs. What really worked for me was the "you're only as strong as your weakest link" philosophy. Much like my arm injury from years back, I looked at my legs as a challenge and hit them hard. Ironically, I blew pass many plateaus through training legs hard. I saw progress everywhere from training symmetrically. I began focusing on diet in my 30s. Even now I believe that diet is keen to believe in yourself. I outlined my diet plan that I share with anyone who asks me how I got to where I am with my body at 40. Humility teaches me that you can always learn. In my mind, you're always two weeks away from being where you ought to be. It's important to truly enjoy the struggles and plateaus you reach and beat. You should never actually arrive to where you want to be. This keeps you hungry. It's essential that you appreciate yourself and your body. If you're off track, learn to love yourself and recognize when you accomplish any progress. This is a mantra that has made me very happy over the years. Of course, I'm still two weeks away. I come from the school that more isn't always more. You should be in the gym for no more than one hour a day. If you're sore or feel out of it, take the day off. If your body is saying, "Hey, give me a break," hit it much harder the next day. It will thank you. Simple is better. Working one body part a week delivers. It gives you the opportunity to focus and allows you to get out before the law of diminishing returns sets in. You're less likely to get injured or burnt out training this way. Your girlfriend will complain less, which is always a plus. I believe the gym is a jungle. If you're getting back into shape you have to be a lion. You may limp on certain days and roar on great days, but you need to have the belief that you are a servant to nobody. You never see a lion on Discovery Channel look down or walk around less than proud. We should learn from that. That's not to say we shouldn't be humble. We need to be in the state of constant learning to help others. When we help others it comes back to us. I break my system into numbers in case I miss a day. You have to live with your diet. Much like a bad relationship, people try to live with a diet that just isn't agreeing with them. You should love what you eat. What I've learned is that you can come to love eating healthy. My wife LeeAnn, who really puts me to shame with how she works out, mixes and matches so many different variations of healthy foods. When my friends ask me, "Don't you ever just want to splurge and eat normal?" I tell them I love my diet. I look forward to eating this way for the rest of my life. Any diet plan that starves you or is nutritional deficient is bad. It's important to feed the furnace. You should eat a protein source every three hours. Keep your metabolism moving so you lean out and build muscle. I like the three jugs philosophy. You have three jugs: muscle, fat, and carbs. Your body will go to to carbs for energy first, then to fat, and last to muscles. If you limit your carbs you tap into your fat reserves. You need to balance though. If you cut carbs, your fat jug will empty and your body will move to the last jug, muscle, for energy. 35 minutes of cardio before breakfast puts you in immediate fat burn mode. Healthy fats are your friend in moderation. No carbs after 7 p.m., except vegetables. Any snacking must be a protein source. Creatine only. In my opinion, it's the only sure-fire supplement that works. I take a serving right before I lift. To be my best. We're in the gym for an hour, whether we talk to our friends or become gods, it's all in the hour. I say take that hour and make it happen. It's up to you. I believe we owe it to ourselves to realize and become the person we ought to be. When I feel sluggish, I point to that. That's not to say that I wouldn't listen to my body and take a day off. Your body will tell you what's up. Fitness modeling and personal training. Helping others is what it's all about. The best help is when you do and expect nothing in return. Better still is to help others in secret. Believe in yourself. Your mind is where it's all at. Create positive thoughts and always recognize yourself. My dad. He always keeps himself in great shape. He doesn't lift but keeps active. He's my idol. 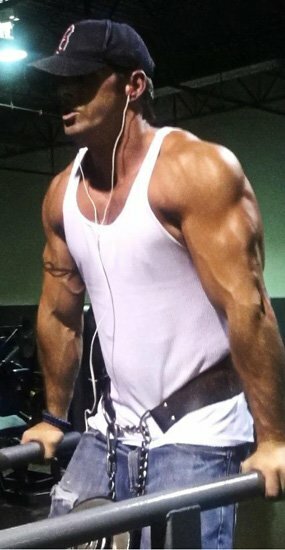 BodySpace, articles, and the exercise database gave me new ideas and answered any questions I had.